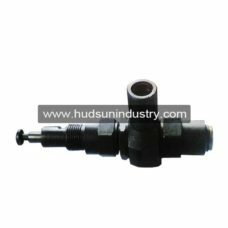 DDB Pump injector is the part for multi-point DDB series of lubrication pump, as replacement or maintenance, this part is original with our DDB pump series. When the eccentric shaft moves to the right-most position, the grease pressurized piston part. 1 is in the extreme right position while the formation of a vacuum in the chamber part. 2, thus grease was pressurized into the house of cylinder from the suction port. When the grease pressurized piston moves to left position, the suction port is closed gradually, grease in channel and inner piston part.3 pressed is pushed to left side, while the piston compression spring part. 5 is also moves to left and open grease port A in order the grease reaches the left side of injector house. Since the check valve part.9 is open, the lubricants is transported to lubrication spots by piping as per the drawing (b). When the piston part. 1 moves to the right side, together with the piston part. 3 to right by the effected spring part.5, the port A is sealed at the moment, it prepares for the next cycle. The cycle of parts movement in injector should continue to each required lubrication points with quantitative delivery grease. When the injector house part. 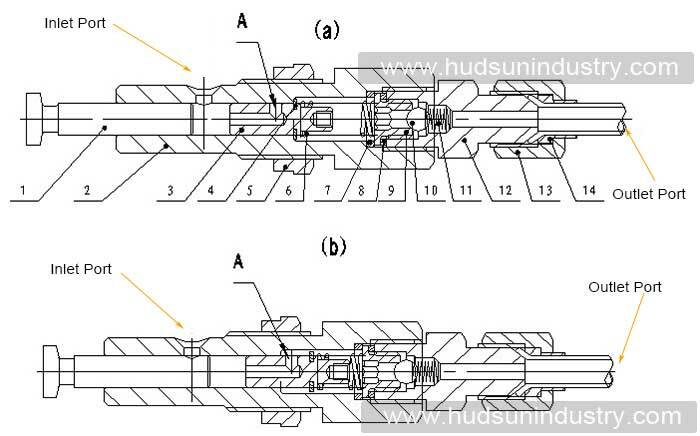 2 is screwed to inside, it increases the effective stroke of the grease pressurized piston part. 3. On the contrary, if it is screwed out , the effective stroke of the grease pressurized piston 3 becomes smaller. Therefore, by adjusting the amount of grease pressurized piston fit to achieve change in the grease feeding supply volume within 0 ~ 0.2ml / times between . The nut part. 6 should be loosen and keeping the nut. part. 6 back when to adjust per feeding volume of injector. 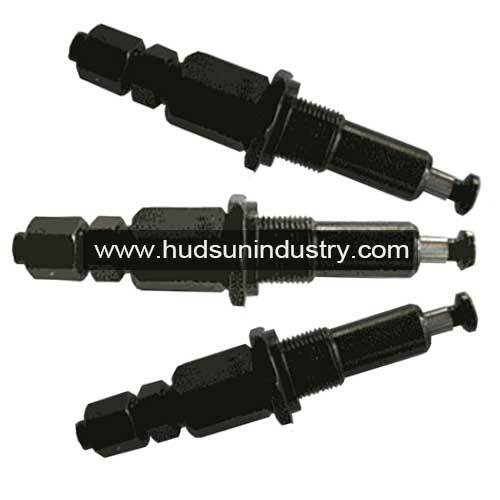 The injectors of lubrication pump DDB-10, DDB-18, DDB-36 will be able to close if some are not put into operation temporarily, just adjusting the feeding volume of injector to zero, or screw out the injector and sealed it with threaded plug. 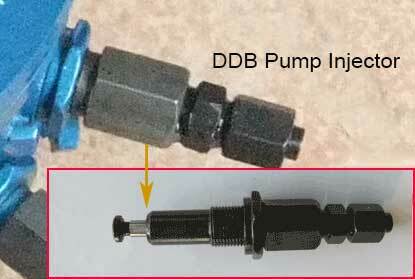 DDB Pump Injector is used to replace the original injectors of DDB lubrication pump series sold by us, the injectors may be damaged if mounting or disassemble the piping frequently, or bad working environment, it is better to purchase it with lubrication pump as replacement part, saving delivery cost and purchasing time.